Highland Park City Hall is located at 12050 Woodland Avenue, Highland Park, MI 48203; phone: 313-252-0050. Photo: Streetscape, Massachusetts Street, between Woodward and John R, Highland Heights/Stevens Subdivision, Highland Park MI. Photographed by User:Andrew Jameson (own work), 2008, [cc-by-3.0 (creativecommons.org/licenses/by/3.0)], via Wikimedia Commons, accessed January, 2013. 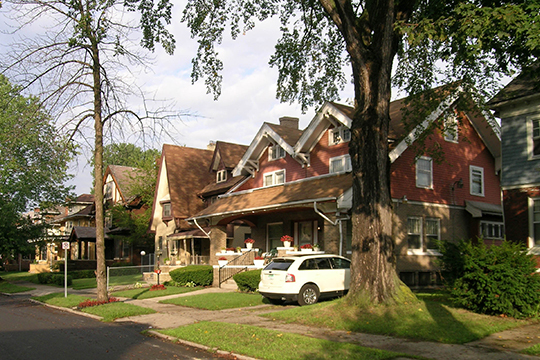 The history and growth of the City of Highland Park is tied to Detroit and the automobile industry. The City has played a special part in the evolution of the automobile and the American labor movement. Judge Woodward platted the area that became Highland Park in 1818 and gave it the name "Woodwardville." Several families settled in the area in the vicinity of the present day Glendale Avenue. The village changed its name to Whitewood later due to the indigenous supply of lumber. In 1836, another small village named Cassandra was platted but was abandoned during the economic panic of 1837. By 1860, the Whitewood post office was established. The Wayne County Atlas of 1876 shows the development of the Detroit Milwaukee Railroad (now the Grand Trunk Line) along with Pontiac Plank Road (Woodward), English Settlement Road (Glendale) and (Alexander) Hamilton Road. The plats indicated 20 to 40 acre tracts fronting Woodward and larger tracts along Hamilton up to 160 acres. This platting was to the be foundation of the subdivision and street development of the City in future years. Some of the early inhabitants included Howell Tyler, Hared Davison, and Royal Ford — the city's first mayor. Detroit was evolving into an industrial city with rail cars, carriages, and stoves. The geography of the region encouraged expansion to the west and north following established road, rail and survey lines which pointed naturally to Highland Park. In 1887, Captain William H. Stevens of Colorado purchased most of the land in the Highland Park area. Having made a fortune in silver mining he began developing the village by building a brick waterworks on Woodward. He made use of the natural artesian wells and fitted them with wooden waterpipes. He built a large stone house on Woodward between Rhode Island and Massachusetts on the site of the McGregor Library. In 1888, the platting and sale of the first subdivision was begun. The community of Whitewood was changing from a decentralized farming community around a major road to a more developed, formally organized entity. Captain Stevens and other town leaders took a major step when the village of Highland Park was platted in 1889. The name originated from a high ridge of land at Woodward and Highland, now graded away. The platting further organized the existing block and elongated grid pattern of streets and gave the village a strong and separate identity from the surrounding farms. In 1891 a school district was chartered and Stevens school was built at Woodward and East Buena Vista. Churches were established by the Episcopalians, Methodists and Presbyterians. The 1893 Wayne County Atlas shows the southern half of the village subdivided with streets named after the early settlers such as Farrand, Woodruff and Beresford. By 1904, many of the northward streets from Detroit, such as John R Street, Brush Street and Second Avenue had begun to extend into the city. City of Highland Park Master Plan 2010, http://www.highlandparkcity.us, accessed January, 2013.